Finding & purchasing old-style keyrings doesn't cost a great deal (thankfully), and can be the basis of an interesting collection. I'm always on the look-out for examples, and most of mine have been found in charity shops or car boot sales. They don't usually cost much, and take very little room to store. 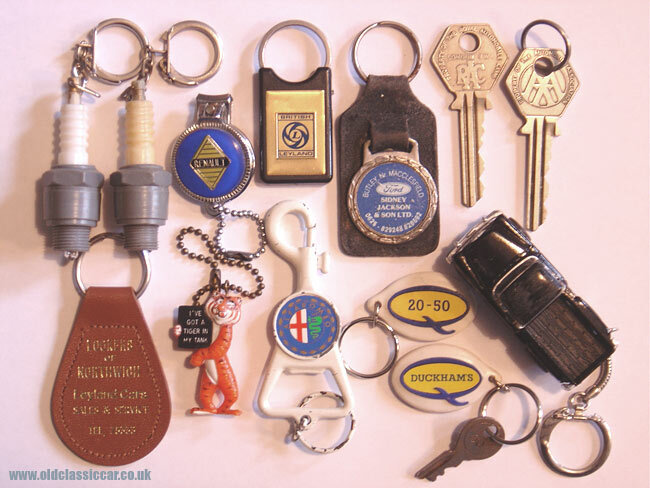 Below are a couple of photographs showing some of my keyrings, which dates I suppose from the 1930s through to the 1970s, with just the Vredestein tyres keyring being a little later. In the photograph above, is a selection of keyrings. 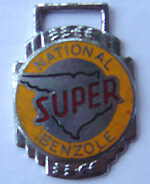 Many originally came with leather fobs, which can fall apart over time and separate from the enamel badge. This is what I think happened to the four examples on the left. The enamel Austin badge is in very nice condition, and probably dates to the early 1960s. The Foden Vehicles enamel is fairly worn but quite rare to find in any condition, and there are plenty of collectors out there who would be interested in finding the National Benzole Mixture enamel, complete with Mr Mercury in evidence. 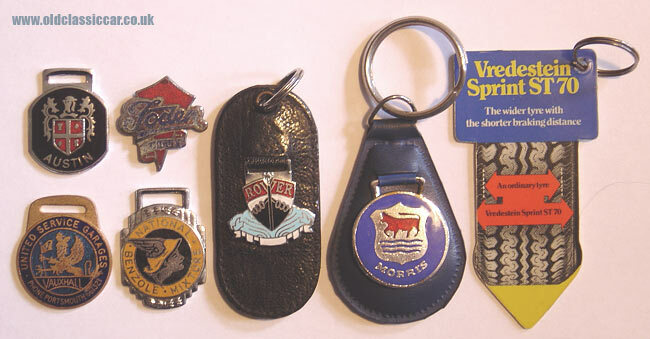 The bottom left keyring is an example of the type that a particular dealer would have given out - in this case Vauxhall dealer United Service Garages, of Portsmouth, who sold Vauxhall cars. This example looks to be from the 1930s at a guess. The black Rover leather & enamel keyfob is in great condition, and was issued by Gibbon (Motors) of Glasgow, who it seems specialised in selling Rovers. I'd say it is from the 40s or 50s. The Morris key-ring is probably from the 1960s, and instead of leather is now made from leather-look plastic! It too is in good order, and was probably given out to purchasers of Minors and 1100s in that decade. Somewhat later in vintage is the Vredestein Sprint ST70 example, which is a flat plastic affair. On one side is a nice display of the tyre tread, and on the reverse a simple tread depth measurement. The second photo starts with a pair of sparkplug keyrings, both of which incorporate a tiny flashlight bulb. Next is a Renault nailclipper keyring, and alongside a rather smart BL (British Leyland) hard plastic job, where the ring rotates around to allow keys to be added and removed. No self-respecting Allegro or Maxi owner would be seen without such a smart keyring. The slightly tatty leather and enamel fob was given out by Sidney Jackson & Son Ltd, who were based over near Macclesfield. On the lower left is an as-new leather fob acquired from Lookers of Northwich, purveyors of Leyland Cars - Sales & Service. It is from the 1970s and is great condition - on the reverse are the BL marques of the day - Austin, Princess, MG, Rover and Triumph. The Tiger in the Tank campaign was a long-running promotional campaign run by Esso in the 1950s and 1960s, this little tiger is made from orange plastic. Next is a rather heavy and clunky Alfa Romeo keyring - it weighs so much that you wouldn't want too many keys hanging on it. The Duckhams Q oil keyrings I found at a car boot sale some years back, on one side is '20-50' and on the other, just 'DUCKHAMS'. The pickup truck is included just out of curiosity, although it is only a few years old. Made in China, it is modelled on a 1955 Chevy truck, and has a friction drive motor inside. Just goes to show that nice things can be found in the many cheapo £1 junk shops that have sprung up on our high streets. At the top right are two keys that will be familiar to motorists from the 50s and 60s - AA and RAC (Yale) keys.